service and location in Khajuraho. for a double deluxe room)! pool/gardens and a nice bathroom. serenity out in the Goan hills. with AC at Palolem Beach. Srinagar that sells beautiful shawls. with a good restaurant at home. the Wildernest Resort in Goa; Agonda Beach in Goa. what I would call 'deluxe' (as that's how they put it to me). dressed in his marigold garlands run away from its handlers. Smells: The smell of burning things; street food; urine (gross but true); spa-like smells; incense. Beach in Goa, cows on the beach; Chinese fishing nets. (reproduced books sold on the street); lots of Ayurveda products; 7 Bollywood CDs. onions, spices and lemon juice. Robbins; Esprit; Marks & Spencer. Visa needed? Yes. I got this in San Francisco. Type of currency? Indian rupee. $1 equals about 40 rupees. 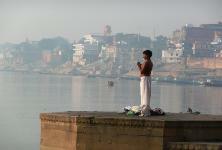 Man praying near the holy Ganges in Varanasi. 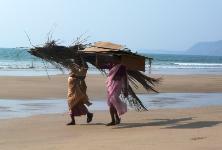 Local women on the Goan beach. Me and my hennaed hands.